I had a very busy time this month, which gave me plenty to write about. As a result, May's blog was the third largest ever in nearly eight years of blogging. There were music festivals and big-event gigs; there were meet-ups and black-tie dinners. There were interesting talks and workshops about technology and, of course, there was lots of photography. I read some great books, watched good television, ate excellent food and drank some extremely nice drinks. It all ended up in the blog. Reading Paul Luna's article about the way the Kindle mangles typography has reinforced my decision not to buy one. Clicking on the black and white picture of the Kindle on Paul's website reveals just how much of a mess Amazon's electronic book device can make of the first page of William Boyd's novel Ordinary Thunderstorms. I may not be enough of a typography geek to employ em-dashes and en-dashes here on the blog (even if I'm enough of a geek to know that I ought to), but I still found all those wrongly-hyphenated words painful to wade through. I can't believe Amazon have the cheek to charge people money for a product that's been so thoroughly borked. And don't get me started on the topic of Amazon's habit of deleting stuff you've bought for the thing. As I continued reading the article I realised that there are problems with just about all implementations of e-books that are available these days. I have therefore resolved to hang on to my printed materials for a while longer. I love printed books - my house is full of the things - and well-employed typography really adds to the reading experience. On the whole, paper books don't get mangled so badly (although some of my friends made stern tut-tut noises when they opened their copies of Zero History last year) and the comparisons in the article between print and electronic copies of texts come out in favour of print, every time. But this begs the wider question: why do so many people get typography so appallingly bad? Steven Moffat says the Daleks will be taking a break from Doctor Who for a while. They are the most popular monsters on the show, and they've appeared a lot - and that's the problem: "They are the most reliably defeatable enemies in the universe." The thing is, according to Moffat, the Doctor has vanquished the Daleks a mind-boggling 400 times. Even for a show that's 48 years old, that's an awful lot of vanquishing. In fact it works out at over eight Dalek stories a year - and that's without taking into account the fact that the series was off the air for more than a decade. That just doesn't seem plausible unless you add in Dalek appearances in the films, the radio shows, tie-in books, comics, and possibly children's lunchboxes as well. No wonder Davros is always so pissed off. That is inconsistent and illogical. You will modify! DALEKS DO NOT TAKE ORDERS! WE WOULD DESTROY THE CYBERMEN WITH ONE DALEK! YOU ARE SUPERIOR IN ONLY ONE RESPECT! There are other foes of the Doctor that deserve a holiday far more than the Daleks do, as far as I'm concerned. In fact I'd really like it if they rested the Cybermen for a while - they're rubbish villains. Their over-exaggerated stomping about has become one of the most irritating clichés on the show and the fact that everything associated with them seems to light up with blue LEDs is almost as tedious. But worst of all, the Cybermen are characterless and boring. A Dalek has a demented form of look-at-me charisma; a Cyberman has about as much charisma as a toaster. Thanks to Mark for tweeting about this amazing long-exposure photo of Endeavour at the ISS. To Charlie Brooker, for revealing on Twitter that Wynne Evans actually is an opera singer, and when he sings in the Go Compare adverts, that's really him singing. So now you know exactly who to blame. Another bank holiday rolls around - I could get used to this. As tradition dictates, it is raining outside at the moment. We haven't had much rain since February, so I can't complain. It also gives me an excuse to stay in and be creative: I've continued bringing the blog up to date and once I've finished this, I'll head upstairs and fire up the music studio, I think. Now here's something I never thought I'd see happen: an iconic locomotive from my childhood brought out of retirement to cope with increased demand for rail freight. It's all thanks to skyrocketing road transport costs. I'm chuffed (excuse the pun) to announce the return of the mighty Deltic. I went through a brief phase of trainspotting as a teenager and even back then the mystique of the Deltic surpassed just about everything else in British Rail's network, not least because there weren't that many of them. 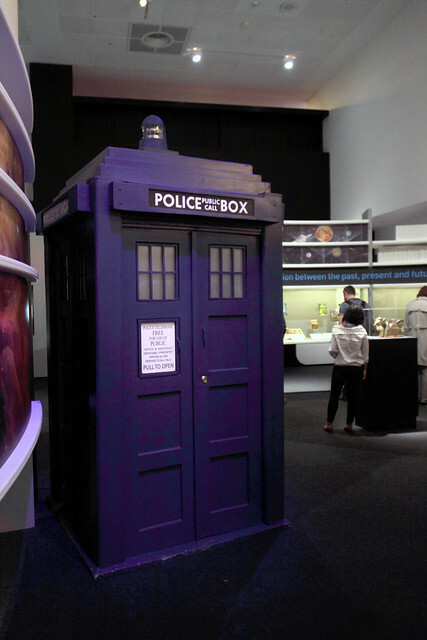 The prototype used to be on display in the Science Museum (and getting it in there must have been quite a feat) but in 1993 it was moved to the National Railway Museum in York. As the report points out, every freight locomotive does the job of 50 HGVs so as far as I'm concerned, the more stories like this the better. Lots of people have been tweeting and blogging this week about the ESO's latest YouTube video, which shows HD timelapse footage of the skies over the Antu, Kueyen, Melipal and Yepun telescopes at the European Southern Observatory's Very Large Telescope at Cerro Paranal in Chile. And with good reason: the shots of the Milky Way and the lesser and greater Magellanic Clouds wheeling above the mountains are breathtakingly beautiful. I spent a happy hour or so today playing on the M3. I'm not sure why, but over the last couple of weeks my keyboard playing seems to have lifted itself off the plateau it had been sitting on for the last decade. Suddenly, things seem to be a lot easier and I'm beginning to play stuff I've been trying to figure out for years. That might have something to do with the fact that I'm playing a lot more these days - the lure of the Korg is very hard to resist. This afternoon I spent a couple of hours listening to old Residents albums. It's difficult to describe the strange attraction of the band, but I suspect if I ever end up on Desert Island Discs my choice would include a song of theirs - possibly The Act of Being Polite from Commercial Album, which they played live at their recent gig at the Camden Roundhouse or maybe Die in Terror or Loss of Innocence from the same album. For me, it's catchy stuff; your mileage may vary. I've spent today chilling out, catching up on some reading and writing up the blog from the last few days. It's been a very relaxed day, and I haven't bothered going out anywhere because it's been grey and blustery out there. I've also done quite a bit of reading. I've finished reading Miéville's Embassytown; I really enjoyed it, more so than Kraken because stylistically it's closer to his earlier Bas-Lag novels, which are particular favourites of mine. Embassytown deals with some interesting concepts, not least of which the way in which language shapes our thinking. The aliens in the book speak a language very different to our own, one in which communication is more difficult from us to them than from them to us. The solution that the humans in the story have developed to this problem allows Miéville to return to some of his favourite themes: doubling and bifurcation. His inventiveness and gothic sensibilities work well in sustaining the believability and the terms he uses for new things and concepts (which Ursula leGuin terms box-words) allow believability without the need for pages of exposition. Miéville isn't afraid to let the reader's imagination fill in the gaps rather than addressing everything explicitly, and I love that. We are told that our reality is the manchmal (German for "sometimes") and that this universe is the third to have existed. Aside from us is the immer (German for "always") that has always existed. It is this immer that the heroine navigates in her journey away from Embassytown at the beginning of the book, and through which she eventually returns: she is, therefore, an immerser. And in immersing, she casts herself into the role of outsider. In different ways, things become their opposites - which in many ways is the central theme of the book. The outsider becomes central to the community; diplomacy becomes subversion; the truth becomes something else, and the shining beacon in the immer which attracted humanity to Embassytown in the first place turns out to have been a warning to stay away. Would I recommend the book? Absolutely. Miéville is one of the most talented writers of any genre active in Britain today, and he's still a youngster, just getting started, playing with ideas and tropes and literary devices to see what kind of new ways he can get them to fit together. He's already an awesome writer. I can't wait to find out what the future holds for him. I've also finished reading Ian McDonald's Cyberabad Days, which I started immediately after finishing his novel River of Gods. Cyberabad Days is a collection of short stories set around and within the events of the novel, and deals with further aspects of life in India in 2047. Climate change, nanotechnology, genetic engineering, artificial intelligence, political intrigue and Indian mythology all play a part in both works. But the overall theme of both books is the Singularity. The Singularity (with a capital "S") is a hypothetical event lying in our future. It's the point at which the rate of technological change and innovation becomes infinite - and it gets its name because if you plot this technological change against time, the curve will (it is suspected) eventually become vertical. This plot looks very much like the plot of gravitational attraction against distance from a black hole, which becomes infinite at the central spacetime singularity. It's impossible to determine conditions after a technological Singularity, futurists say, because it lies beyond some form of event horizon of human experience. Nobody's really set out in simple terms what that is supposed to mean other than stretching the gravitational metaphor somewhat further than advisable, but it's a useful way of getting out of long-term predictions. The Singularity may never happen, of course; it is normally associated with the development of artificial intelligences with capabilities many times those of human beings, and that has been "thirty years in the future" since I was a small child. McDonald's take on the Singularity is considerably more pessimistic than most. In India at the end of the 21st century it's only the middle classes upwards who get to participate. Sadly, I think McDonald is spot-on with this observation. For the poor, life will go on pretty much as it has done for thousands of years. The only difference is that there will be new hazards to struggle with: not all futures are as optimistic as those seen on Star Trek and the tone of the final short story in particular is considerably darker than the novel. Again, I recommend McDonald's work very highly and his novel set in a near-future Istanbul The Dervish House is one of the best books I've read this year. Next on my reading list is his novel Brasyl, followed by Necroville - so you can see I've become a bit of a fan! Yesterday I went into London for the third day running - and I don't think I've done three days in a row in the Country's capital since I worked there back in the 1980s! Yesterday was a bit different, though, as I was kitted out in black tie and tuxedo for dinner in the Great Hall at Barts. And yes, as I travelled up to London Bridge on the train I was thinking to myself, "Bow ties are cool." Particularly as I'd spent much of the past week practising tying it. No clip-ons for me! I was at Barts for the annual dinner of the Society of Young Freemen of London; it was my friend Victoria's last event as SYF Chair. After drinks in reception I walked past paintings by William Hogarth as I climbed the staircase up to The Great Hall on the first floor of the North Wing. I'd never been in the building before, and it is a quite extraordinary place. The food was very good: the starter was asparagus, fresh figs and bocconcini with balsamic reduction, followed by roast rump of West Country lamb with a pecorino herb crust, a mushroom and thyme jus, fondant potatoes, sugar snap peas and baton carrots, then an apple tart with mascarpone and blueberries and raspberries for dessert. Then there was coffee, and then port. Delicious! There were toasts to the Queen, to Prince Phillip, the Prince of Wales, the Duchess of Cornwall and other members of the Royal Family, to the Lord Mayor and the City of London Corporation, to the SYF's guests. The last speech of the evening was by Victoria, summing up her year as chair. But we weren't done yet. There was a ceilidh to follow! It's been a while since I had a go at any of the dances and I was (as always) terrible at them - but that's not really the point. It was great fun having a go and everyone else seemed to be having a good time too. All too quickly the evening was over and it was time to head back to London Bridge and catch a train back to Orpington. I got in just after 1 o'clock and not surprisingly fell asleep without much trouble at all. My first port of call after arriving at Charing Cross was Covent Garden, where the cars from the 2011 Gumball Rally were all on display. There were some serious lumps of automotive hardware parked up, surrounded by hordes of blokes looking at them and drooling. It was starting to rain, so I didn't stop to take photos. Any image I could have taken away would have consisted of portions of car masked by large numbers of middle aged men and the occasional guy wearing a baseball cap and laminated pass trying desperately hard to look cool but being utterly eclipsed by the metal and carbon fibre of his charges. Now that technology has become entertainment, its operators become impedances to the spectacle. I left, heading north. My destination was fairly predictable: coffee and a sandwich at Caffè Nero in Seven Dials. It's getting to be a bit of a habit. I sat upstairs enjoying my mug of latte and people watching, both inside the shop and outside. London hosts a much more cosmopolitan mix of people than it did when I worked here, and I find the place fascinating. Given the weather, I wasn't in any particular hurry to get anywhere, either. Several intense pulses of rain moved through while I used Nero's free wi fi to update Facebook and Tweetdeck. But finally I finished my coffee, so when the rain eased off I headed up to Forbidden Planet in Shaftesbury Avenue. I was looking for a couple of books in particular - Desolation Road by Ian McDonald and fellow wigber Tim Akers's latest novel Dead of Veridon (forgetting that although it's available in the US right now it doesn't come out over here until next month), but I drew a blank. Instead, I wandered up Charing Cross Road to Foyles where although I failed once again to find what I was looking for, I picked up a signed first edition of China Miéville's Embassytown. Result! The exhibition had kicked off on Tuesday night with a panel discussion which featured, amongst others, Cory Doctorow and William Gibson, but sadly I wasn't able to make it. 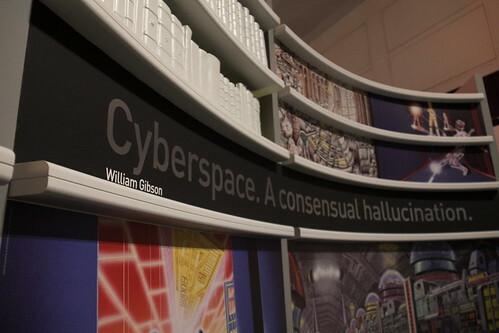 Gibson featured prominently on the displays, with a copy of Omni magazine open at his short story Burning Chrome, a first paperback edition of Neuromancer, and a memorable coining of his from the same novel. The exhibition was quite busy for a Thursday afternoon during work hours. It was split into a number of areas each with its own theme, like cyberspace or the End of the World. I gazed at vintage copies of the Radio Times with daleks on the cover, the original manuscript for Francis Chagrin's music from the 1964 episode The Dalek Invasion of Earth and I watched video contributions from an eclectic mix of speakers including Ray Kurzweil, China Miéville and Lauren Beukes. I was in geek heaven, believe me. On the way back to the West End, the heavens opened. I ducked into doorways and stayed under canopies when I could, but I was soon soaked. I made it as far as Long Acre, then ducked into a Marks and Spencers to buy an umbrella and something dry to wear. Back outside in a cotton jacket rather than my waterlogged leather one, I felt a bit better. Then the thunder and lightning started and the rain got even heavier. In minutes I was just as bedraggled as before and my feet were soaking. I found a branch of Eat in Piccadilly and spent the rest of the afternoon there, drinking tea and slowly drying out. I'd never been to Bob Bob Ricard's before, but Candace and Nikki love it there. Nikki's enthused about the place before and after tonight, I can entirely see why. The food is a mixture of English and Russian and is very good. The cocktails, however, are extraordinary. 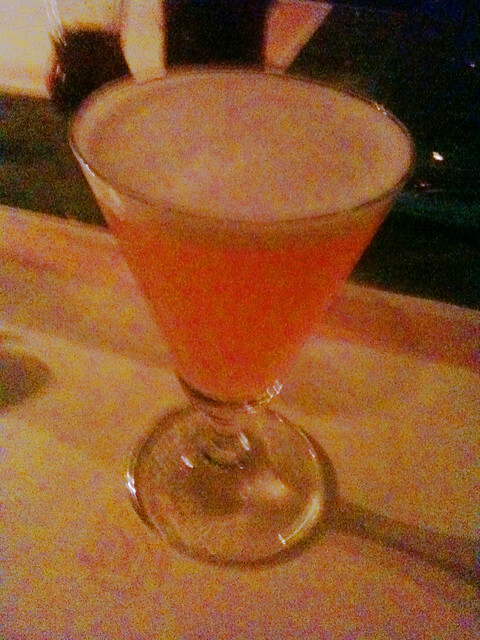 The drink above is a rhubarb gin and tonic, which I had as an aperitif - it was delicious, but even that was eclipsed by the English 75s I had while we chatted in the bar downstairs before dinner: a mix of earl grey tea syrup, lemon juice, Hendrick's gin and sparkling wine. Next time I must try their clear bloody mary, made with clarified tomato juice. As for the food, I had the BBR beef tea soup as a starter: a bowl containing tiny cubes of raw sirloin steak, a poached quail's egg, and pasta letters ("b's " and "r's" of course) over which you pour a teapot of beef stock. It reminded me of a subtle version of Bovril in a way, but the steak cooks rapidly in the stock and infuses the broth with a rich umami taste and the whole thing was delicious. I followed that with chicken kiev which was served with potato and sweetcorn mash. It was very, very tasty but by the time the waiter came back with the dessert menu I was too full for anything else! An evening with the WGB crowd is always good fun, and I didn't really want it to end. However I eventually found myself on the train back to Orpington. As I walked back from the station I was surprised how busy it was. A hundred metres or so in front of me another passenger off the train was singing along to her personal stereo, quite loudly and entirely oblivious. She had a pretty good voice, too! I got back to Dave and Cathy's at around one o'clock. There, weary of the dawn chorus, I put in the earplugs I'd worn at Rush on Wednesday night. The combination of all the walking I'd done, the food, the cocktails and the earplugs worked a treat and I slept through until 9am on Friday morning! I could really do with more evenings like that. On Wednesday afternoon I drove over here from Bristol. It was a bit of a slog, as the M25 had ground to a halt thanks to a multiple vehicle collision at junction 9. At three and a half hours it still took much less time than my trip last December! I hopped on the train and made my way to the O2 at Greenwich, where I met up with my brother. 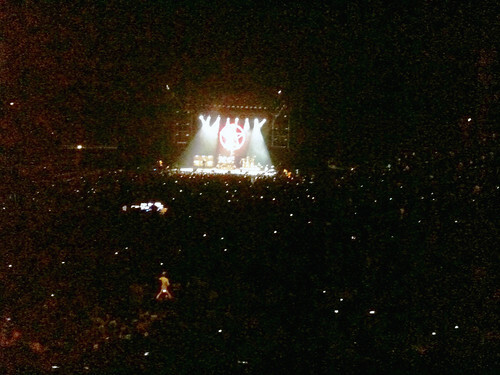 We were there to see one of my favourite rock bands, the Canadian power trio Rush. I was wondering during the first couple of numbers whether Geddy's voice was going to last out the rest of the concert, because it was all over the place. He was soon singing away without any trouble, so I suspect it was a temporary problem with the monitors and he hadn't been able to hear the sound of his own voice. However, the whole first half of the show suffered from an atriocious sound mix. Geddy is still running his bass straight into the PA rather than using a backline (so instead of amps there was what appeared to be a steam-driven sausage machine standing behind him.) As on the last couple of tours, this means that the bass tends to disappear once Neil cranks up the drumming unless the crew are really on top of things and to start with the crew clearly weren't. Things improved after the interval, when the band played through the whole of Moving Pictures from start to finish and by the end of the show the band were sounding fine. The light show was impeccable; I have never seen anything like it. The lighting trusses morphed and shifted during the songs, as if the band were sharing the stage with Optimus Prime. 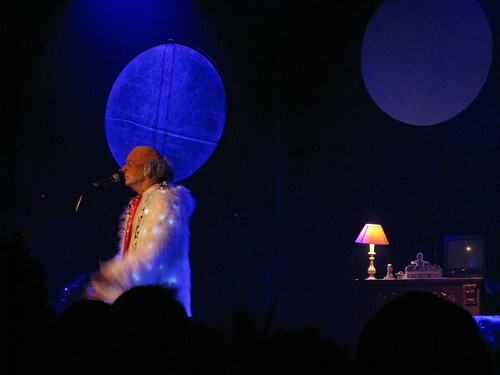 There was plenty of use of LED striplights and ultra-bright strobes and the rear-projection screen was used to great effect to carry over the steampunk theme of Geddy and Alex's backline. Neil had a new set of drums, of course - and these were gorgeous with each cymbal decorated (engraved?) to look like a gear wheel. Little plasma lightning generators dotted around the base of the kit made the thing look like it had just been lifted from some antique Borg spaceship. The drum solo was, as ever, extraordinary. It's a three-part masterclass in percussion, moving from traditional techniques to electronica (the kit spinning through 180° so we could get a good look at what Neil was doing) with samples and multi-sound triggers, and then rotating back to the jaw-dropping big swing finale. The Professor has still got it, that's for sure. We got several encores. La Villa Strangiato now features an introduction that had me laughing my socks off, followed by a version of Working Man that starts out as solid reggae. Alex clearly wasn't pleased about something during this part of the show, and he eventually ripped his in-ear monitors out. The Professor dropped a drumstick at one point; one song veered off into unknown territory before being wrestled back. But despite this I'd say it was the best set of theirs I've seen for a decade. The musicianship they demonstrated is in a class of its own. Dave had been worried about getting back from the gig as there had been problems on the Jubilee line during the day but the O2 area was very well organised and in the end we made it back to Oprington by midnight. As Dave and I walked back along the Sevenoaks Road a fox trotted across the road in front of us, bold as anything. It was a nice final touch to a great day. Gottfried Leibniz once wrote that "The pleasure we obtain from music comes from counting, but counting unconsciously. Music is nothing but unconscious arithmetic." Now Leibniz was a mathematician so we should cut him a little slack but for me, music is so much more than simply counting. Well over a month ago, Roz tagged me on something called the "30 day song challenge." You're given a list that describes thirty different ways in which songs might mean something to you. Over the space of a month you have to populate each entry with a particular song. Think of it as a word-association exercise, but with music rather than words. It's a lovely idea, so I joined in. I've been a bit lax on posting my choices and I took quite a lot longer than thirty days, but yesterday I posted the last one to Facebook. I thought I'd add them to the blog as well, so folks can check them out in a single, easy-to-access location. Here they all are - enjoy! Day 01: your favourite song: A music promo that features a "Stop Rock Video" demonstration, bizarre choreography, and John Flansburgh smoking a pipe. And the song itself? About as close to perfection as you can get, IMO. Birdhouse in Your Soul by They Might Be Giants. I love TMBG. Day 02 - your least favorite song: China in Your Hand by T'Pau. Back in the days before autotune, singers could sing consistently and painfully flat - and still make it into the charts! Day 03 - a song that makes you happy: Yankee Rose by Dave Lee Roth, helped out by a stellar band: Steve Vai, Billy Sheehan and Gregg Bissonette. Four guys at the height of their powers having an absolute blast. Listening to it still leaves me grinning from ear to ear. And the video has one of the most off-the-wall intros of all time: "Gimme a bottle of anything, and a glazed doughnut. To go!" Day 04 - a song that makes you sad: That would have to be the latest from Mr Thomas Dolby, which moves me to tears; sad, but in a good way. The music is hauntingly beautiful and I think it's one of the best things he's ever done. Oceanea. Day 05 - a song that reminds you of someone: Judie Tzuke's Black Furs will always remind me of Anita, who loved Jude's music but who died in 1992 at the age of 32. She was an amazing person and I still think about her every day. Day 08 - a song that you know all the words to: Jiggery Pokery by the Duckworth Lewis Method. I wonder if the cricketer Mike Gatting knows the words, too? It's about him... I was in the audience of this recording, too! Day 10 - a song that makes you fall asleep: NUUK (DAY), from Thomas Köner's album Nuuk. Perfect ambient material for chilling out to! Day 12 - a song from a band you hate: I was going to say that "hate" is too pejorative for use within music, and that we should respect each other's musical endeavours. I was going to say that there isn't a musician or group on the planet who I actively hate. Day 14 - a song that no one would expect you to love: Your Feet's Too Big by Fats Waller. Deep joy. Day 16 - a song that you used to love but now hate: Love Like Blood by Killing Joke. The only band I've ever bought a ticket to see who decided that they hadn't been paid enough money and refused to go on stage. There was a riot. Never got a refund. I used to love their music; not any more. Day 17 - a song that you hear often on the radio: The Cinematic Orchestra's All Things to All Men - a killer groove, Roots Manuva, and a Doctor Who reference thrown in for good measure! A track beloved of radio and TV producers who use it more than any other piece of music I know to establish a background vibe. Ace. Day 18 - a song that you wish you heard on the radio: Where Were You by Jeff Beck. The control required to play like this is truly awe-inspiring, yet it's also one of the most emotionally powerful pieces of music ever produced. I've seen him play this live several times and I still don't know how he does it. Day 19 - a song from your favorite album: According to Last FM, my most listened to album is Atavachron, by Allan Holdsworth. Here's All Our Yesterdays, the last track on the album, with haunting vocals by Rowanne Mark, drums by Chad Wackerman, and everything else by Mr H.
Day 20 - a song that you listen to when you're angry: It's hard to stay angry when you're laughing and few people make me laugh more than the wonderful Mr Tom Lehrer. This is my all-time favourite song of his - Poisoning Pigeons in the Park. Sheer unadulterated genius. Day 21 - a song that you listen to when you're happy: The secret of happiness? Cake. TMBG's Seven. 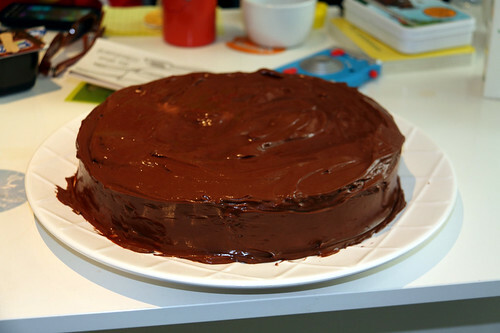 Now, who would like some cake? Day 22 - a song that you listen to when you're sad: May You Never by the one and only John Martyn. The best version I have ever heard is this duet with Kathy Mattea from the Transatlantic Sessions, 1995. Realising he's no longer with us still hurts. And typing this while I watch the video, I have tears in my eyes. Make sure you watch right to the end, because the gleeful little dance he does when they finish is something joyous to behold. "I like that one!" Day 24 - a song that you want to play at your funeral: Couldn't really be anything other than Ace of Spades by Motorhead. Lemmy and his pals changed my life for the better in so many different ways, and hopefully playing this'll raise a laugh. Extra bonus content - Rik Mayall, Ade Edmonson, Nigel Planer and Chris Ryan wreaking havoc at Bristol's Temple Meads Station in the video! Day 26 - a song that you can play on an instrument: Well, the only thing I've played at a music fair that had other people nudging each other and pointing at me was this: Cathedral, By Eddie van Halen. It's actually quite simple, but echo is everything, folks. Day 28 - a song that makes you feel guilty: I am terrible at keeping in touch with friends, and I haven't heard from Sue - who gave me the album this track is from - for more than 20 years. Lisa Dalbello should be more famous than she is, she's awesome. Pink Floyd's Dave Gilmour played guitar on the album version of Immaculate Eyes, by the way. Day 29 - a song from your childhood: There is one song above all else that I remember listening to as a very small child. And that song was The Ying Tong Song by the Goons: Harry Secombe, Spike Milligan, and Peter Sellers. No wonder I'm weird. Day 30 - your favorite song at this time last year: Well, it's been a whole year since he passed, and this list wouldn't be complete without one of rock's true greats: Ronnie James Dio. Here's one of my favourite songs *ever* - Rainbow's Stargazer from Rainbow Rising. He isn't done yet. Did I say May? I got the maths wrong - I meant October. Just like we knew he was going to, Harold Camping has revised his prediction for the apocalypse to October 21st. And what about his followers, who are facing financial woes as a result of his predictions? More fool them, apparently. "We just had a great recession. There's lots of people who lost their jobs, lots of people who lost their houses... and somehow they all survived," he said, adding "We're not in the business of giving any financial advice." Sorry, but that's just plain brutal. And remember, this is from a guy who's made it his life's work to promote Christianity. I can remember the first few times I visited the United States I was struck by the fact that every small town we passed through was world-renowned as the centre of production for something or other. How exciting, I thought. What an opportunity to by postcards, t-shirts and other related merchandise proclaiming the fact that I'd tracked down the chain of production to its ultimate end! As a result, I know that Gilroy, in California, is the garlic capital of the world. Dothan, in Alabama, is the peanut capital of the world. However, after a while I began to realise that the reason I was finding all these world capitals of commerce had nothing to do with luck. It had more to do with the fact that almost every conurbation in the USA has staked a claim as the world capital of something or other. Even so, I was a little more surprised to discover on my virtual travels that the Swiss cheese capital of the world is located in Monroe, Wisconsin rather than well, somewhere in Switzerland. But Monroe's claim to fortune is positively mundane next to some of America's most ridiculous city slogans unearthed by The Atlantic magazine this month. Now I know where the world's turf grass production is centred (Savannah, Georgia), I can point to the home of the Ding Dong Daddy on the map (Dumas, Arizona), identify the toothpick capital of the world (Strong, Maine), and most intriguingly of all beckon you towards Linesville, Pennsylvania, "where the ducks walk on fish." Truly, America is a land of wonders. Ladies and gentlemen, the late and extremely great Mr Jack Kirby. And while we're at it: Kirby's unpublished adaptation of The Prisoner, the Kirby Museum, a selection of plaudits from fans and professionals alike and the great man's Wikipedia page all bear testament to his awesome talent. Thanks to Colin for this one. The life of Vic Armstrong, Hollywood stuntman. You might not know his name, but you've almost certainly seen him do his stuff. He's been a stuntman in an impressive selection of films, from abseiling into a volcano in You Only Live Twice to jumping off all sorts of different vehicles (and horses) on the Indiana Jones movies. But I'd just like to point out one of his non-stunt roles: it's Vic, not Harrison Ford, in the bathroom scene when Deckard finds the snake scales in Blade Runner. So are you. And so are a lot of very sheepish people who thought they wouldn't be. Some believers who maxed out their credit cards on pre-apocalypse splurges are now going to have to deal with a rather different form of reckoning. I wonder if Mr Camping, whose Family Radio International Christian broadcasting network had assets in 2009 totalling $104 million, will be helping any of them out? I'm sure it would be the Christian thing to do. Meanwhile, air travel in Iceland is being disrupted because of a volcanic eruption. Newsreaders everywhere are breathing a sigh of relief that this year's culprit, Grimsvotn, is considerably easier to pronounce than Eyjafjallajokull (that's Ey-ya-fyat-la-yoh-kutl, remember) was last year. And no, Grimsvotn isn't the volcano that's known for erupting in sympathy with Eyjafjallajokull - as I pointed out last year, that's Katla. At least Iceland's Meteorological Office is saying that this eruption is producing "the right sort" of volcanic ash, and the problems should be minimal compared to those in 2010. Grimsvotn needs to be treated with respect, though. It forms part of the Laki system, which erupted from 1783-4 and killed off half of Iceland's livestock. The resulting famine killed over a fifth of Iceland's population. I've had a pretty decent weekend, even if I'm still struggling to get a decent night's sleep. After a mammoth gardening session yesterday the back garden looks much better and I can see the patio once again. I'm paying for it today, as my back is aching, but it was worth it. The shrubs in the back garden have grown considerably over the past couple of years and they'd completely overwhelmed the bird bath, so I moved it back onto the paved area, gave it a good wash down and refilled it. It's gone down well with the local avian population, and one blackbird in particular kept on coming back every half hour yesterday evening for a drink and a quick splash. It was lovely to see. I wanted to get something creative done this weekend, and ended up writing 800 words or so on a little piece about inspiration I started back in February 2006. It hangs together okay, I think. I also wanted to do some drawing and some recording. I haven't tackled the pencils and pens yet, but I spent a couple of hours yesterday and today noodling on the M3. I've got a few ideas spinning around, but they're not developed enough to record. However, I am loving the Korg. Having an immense palette of sounds is inspiring, and there are several programs in particular that I love, like "cinematic piano" which is a very soft, distant grand piano that's dripping with reverb. Sweet. Harold Camping, who has apparently been plastering the United States with adverts and posters heralding impending doom, did pretty much the same thing back in 1994, but planet Earth carried on regardless. Did I say 1994? I meant March 1995, said Camping. He's not the only prophet to be let down by reality over the years, either. Oh no. Not by a long way. Don't get me wrong: I know religion is a great support to millions of people and it's been a massively effective means of social control for thousands of years. But it's not for me. Another tip of the hat to Alan for tweeting about Stickers on the Central Line. The potential of sticky backed plastic for bringing a little brightness into the lives of London's commuters is realised at last. One or two of these are inspired. The more I see what people are doing with it, the more I'm convinced that Microsoft's Kinect technology is the most influential and game-changing thing the company will ever produce. Just have a look at the Ghost in the Shell-inspired high jinks they're getting up to with it in Japan! Metafilter (one of my regular haunts) points me in the direction of an interview with Edward Tufte. Tufte's books on the graphical presentation of information were at the top of my reading list when I was doing my masters degree and I've been a big fan of his work ever since. The interview is fascinating. And also via Metafilter: Area 51 Uncensored. Annie Jacobsen's new book makes some interesting allegations about what really happened at Roswell, if there's anyone out there who is still interested. While the new scenario is rather more prosaic than the usual little-grey-men-from-zeta-reticuli fare, it's still a jaw-dropper. Last Saturday's episode of Doctor Who was something special - not least because it was written by the rather wonderful Mr Neil Gaiman. He's now blogged about his experience. It was obviously a pleasant one, and I sincerely hope that he's given the opportunity to write for the show again. I have a day off work again today - recovering from getting back from London in the small hours of Sunday morning. I arrived home just after 3am, and by the time I got to bed it was getting light outside. I haven't done that for a while! So far, today has been devoted to topping and tailing blog entries from the past week, and bacon and mushroom sandwiches. Despite the fact that the shuttle has had a rather chequered career, it was still very sad to realise that we'll only get to watch one more shuttle roar up off the pad, when Atlantis flies some time in July. 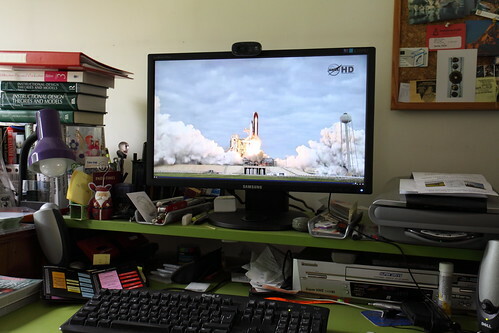 Once Endeavour gets home from this mission, it will be sent off to spend its retirement in a museum. 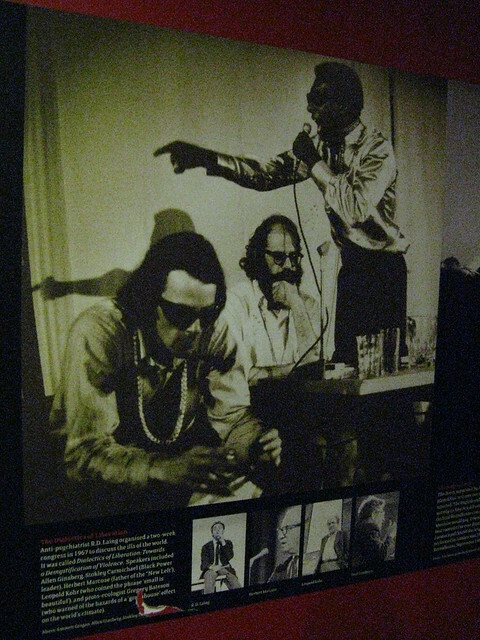 That's activist Stokely Carmichael in full flow with (I think) the event organiser R D Laing on the left and the beat poet Allen Ginsberg in the middle. The photo was taken by Andrew Whittuck, who was my host and tutor on the photography course I went on in France back in 2009. I guess I should have expected it, but I was disappointed by how many of the artists at the festival were performing with laptops (with the Apple logo in evidence in almost all cases) rather than using what I'd describe as "real" musical instruments. For example, of the bands that I saw, only Liars and S.C.U.M. had someone physically present to play bass guitar; everyone else was using samples. Then again, one person who I certainly didn't expect to see rocking an acoustic guitar on stage was Vince Clarke from Erasure! I was joined at the festival by some of the WGB crowd who - as always - were excellent company. Much coffee was consumed. There were some interesting talks going on at the periphery of the festival, too. I learnt a lot from a session on audio mastering given by Stefan Betke, a.k.a. Pole, who answered questions from the audience and also gave a very quick rundown in the best way to set up your home studio. Someone asked him why record companies spend so much effort remastering albums (citing the exapmple of David Bowie, who is apparently now on his fourth set of remasters). Stefan's answer was unequivocal: "To sell albums. 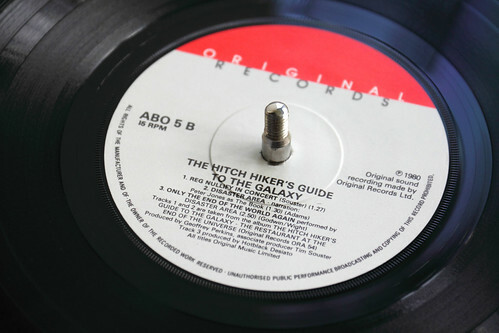 There is no other reason once you've mastered something for CD rather than vinyl." Someone else asked him for advice on improving one's "ear" - the way you hear things in a track; developing a capacity to detect imperfections and remedying them. His response to that question was simple: "Delete your MP3 collection!" If you've been reading my occasional rants over the years on the subject, you'll understand why I found it so nice to discover someone who still appreciates audio quality. Then I headed over to a packed Torquil's Bar, where legendary record producer Mark "Flood" Ellis gave a very funny talk about his work with Mute Records artists. In doing so, he took the piss out of most of Depeche Mode with what I am assured were some spot-on impersonations. He illustrated his talk by playing samples and loops on his laptop, describing how some of the most famous tracks he produced came into being. Pole and Flood's talks on their own were worth the price of admission to the whole festival. This is "Randy" - who told us a selection of macabre stories about subjects such as the little old lady who you really wouldn't want living next door, and the mirror people who live on the other side of the glass in his bathroom. He was accompanied by "Chuck" on guitar and "Bob" on keyboards who laid down a suitably left-field soundscape for the tales to inhabit. It was classic Residents high weirdness from a band who have maintained almost complete anonymity in the 40 or so years that they've been playing. The role of the outsider has never been performed more effectively or consistently in popular music, although I still harbour a sneaking suspicion that they had something or other to do with The Banana Splits - listen to the vocals on "Commercial Album" for example, and you'll hear distinct similarities. I've been fascinated by them since I was a teenager but I'm ashamed to admit that this is the first time I've managed to see them play live. There were no eyeballs wearing top hats and tuxedos, but the band exuded such an aura of strangeness that the first couple of times they interacted with the audience they were met primarily with stunned bewilderment. The expressions on the faces of many of the people watching were hilarious, consisting of just about every permutation of "WTF?" you can imagine. Classic stuff, and I was so glad I'd got to see it! There don't seem to be enough hours in the day at the moment. Certainly the last week has been a very full one, and I've spent a fair bit of time today trying the catch up with my blogging. I haven't succeeded yet! Not going to have time to write much today as I'm off into Bristol shortly to see the Uncaged Monkeys tour - and I'm really looking forwards to it, particularly as I somehow managed to snag a front row seat! I'm delighted to announce that I got the M3 back yesterday and it's now working perfectly. Expect to see the results on this website in the not too distant future. I had a really interesting day in Bristol today taking part in the Systems/Layers Walkshop run by Adam Greenfield and Nurri Kim of Do Projects. Many thanks to Peter for giving me a heads up on the day and suggesting I might find it interesting. He was right - it was fascinating. 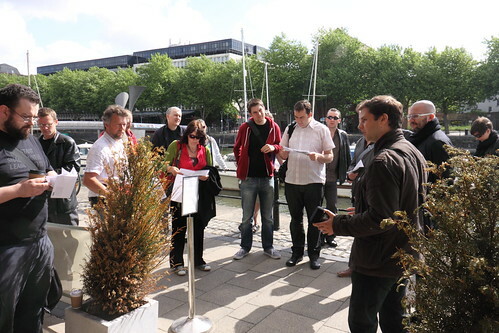 Systems/Layers is a half-day 'walkshop', held in two parts. The first portion of the activity is dedicated to a slow and considered walk through a reasonably dense and built-up section of the city at hand. What we’re looking for are appearances of the networked digital in the physical, and vice versa: apertures through which the things that happen in the real world drive the 'network weather', and contexts in which that weather affects what people see, confront and are able to do. This pushes a lot of my geek buttons. As a kid, one of my favourite books was the Observer's Book of British Architecture and I still have my copy. The impeccable line drawings it contains are still a joy to behold, and they were one of the first influences on me as I tried to develop my own illustrative style. Through repeated readings of the book I became intrigued by the way in which buildings have evolved (for want of a better word) over time. To this day, I love finding out why structures are made the way they are and reading about the design choices that are involved (and I must provide a very grateful tip of the hat here to Geoff Manaugh's exceptional BLDGBLOG for providing a constant stream of cool articles in this area). The Observer's book also helped me to start thinking about how buildings work - and here I'm not just talking about the physical engineering involved in lintels and columns or buttresses and finials; I mean how people interact with them, how they negotiate their way through a given space and how understanding of the affordances of public and private areas is acquired, developed, and communicated. Helping people to learn things has been my principal professional interest for more than thirty years now, but this process in turn leads on to discussions of areas that are related to some degree or other like semiotics, archetypes, graphic design, the introduction of new technologies and the decay of the old, and the acquisition, distribution and presentation of information. And, of course, I work for a large IT company: computer networks play a large part in my everyday work. From this you'll understand that the combination of the walkshop's subject matter was pretty much irresistable. I sent off an email to Nick Triggs, who was organising the day's event on behalf of the University of the West of England and the Digital Cultures Research Centre, and got myself a place on the event. Peter managed to join me for the day, which was a bonus. As we walked around the square, I learned about public private partnerships and the size and global reach of companies such as Adshel. This was a surprise to me; the Adshel website, dripping with marketing spin (bus shelters do not "beautify" a town, no matter how desperately they might wish it to be so) lends a faintly Orwellian air to something as mundane as urban signage. Signs of one form or another surrounded us in the square. They also lay underfoot, as we walked across David Ward's Zenith installation, which uses 52 runway landing lights to map out an analemma on the ground. I was surprised that nobody else on the tour knew what the installation was or what it represented, but I guess not everyone is an astronomy geek! We returned to the Big Brother theme as we discussed the big video screen mounted on the At-Bristol building. Like Winston Smith's visiscreen, it is never turned off - it is just dimmed during the hours of darkness. Again, a private company is in charge of the controls for the device; it is not operated by the Council. Apart from our group, the square was predominantly empty and the screen was playing without an audience. Adam spoke about the technology available to track public attention to billboards, which is such a sinister idea the hair on the back of my neck was standing on end. Not only is it possible for advertisers to check whether or not you are paying attention, Adam explained that they can also determine your age (to within 4 bands), your gender, and certain factors depending on your ethnicity. And as he pointed out, not only do you have no say in whether or not you should be included in this activity, even if you actively avoid paying attention to the display you still provide a valid data point. Very scary stuff. 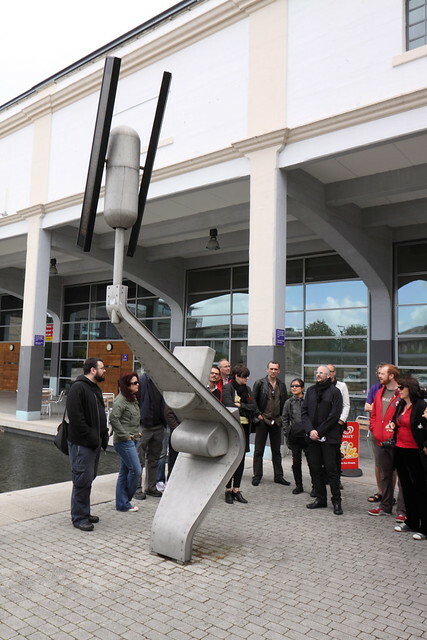 One element of the walk that was singled out for praise was the Space Signpost (which is one of my favourite bits of Bristol). It's got a great interface, it's popular with locals (several people used it while we were there) and it's built like a tank. It's been in pretty much constant use since January 2006. By contrast, the iPlus terminal around the corner was in a bit of a sorry state. 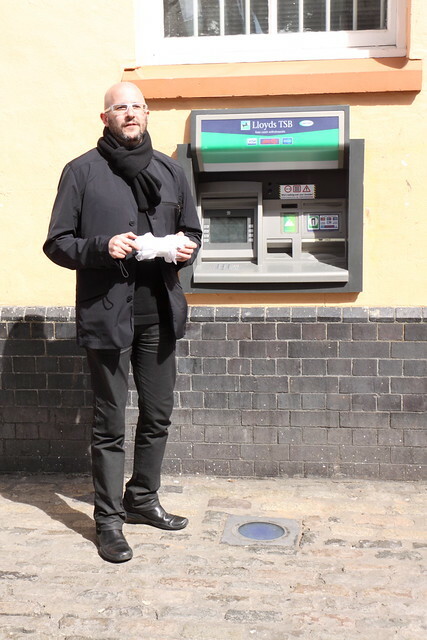 Adam observed that the design of the kiosk, coupled with the fact that it was placed about four feet from a blank wall, meant that it saw more use as a public urinal than as an information access point. Peter wanted to know if the unit's "print" button still did anything, and much to our surprise, it did. However the small square map that was deposited in the slot below its screen was pretty useless, and printed on thermal paper: a source of Bisphenol A, which is an endocrine disruptor and not the sort of thing you want to be getting on your fingers - or releasing into the environment. Adam pointed out the stunning array of logos and branding on the device - I think there were 16 different ones on this one! As I've commented on this photo's Flickr page, the technology of ATMs can be subverted by cameras and card skimmers and this is one scare that has moved rather rapidly from urban legend into hard fact from Barnstaple to Dumbarton and from Clitheroe, Colne, and Inverness to Portsmouth. 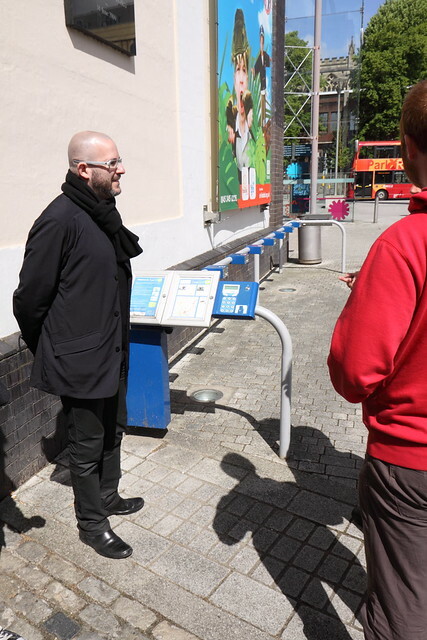 Directly opposite was the entrance to the Pervasive Media Studio, and Adam talked briefly about the implications of access control and how some of the same approaches are now being applied to other aspects of city life. He is clearly concerned about the social implications of this, as he mentioned it again in the talk he gave at the Watershed that evening. By this point we'd been on the walk for nearly two hours and it was time to head back to the Harbourside for lunch and a wrap-up discussion about what we'd discovered. Adam was clearly delighted with the observations that everyone made; it was a thought provoking session and as we headed up Park Street afterwards to grab another coffee I found myself looking at Bristol with a fresh pair of eyes. I also managed to work in a visit to Forbidden Planet in Shaftesbury Avenue where I'm afraid I ended up buying yet more books, including a signed copy of Christopher Priest's The Prestige. I had a good day. And that's good news for general relativity. NASA's Gravity Probe B was designed to investigate two of the Earth's properties predicted by Einstein: the geodetic effect, where the mass of our planet bends spacetime (usually demonstrated on science programmes by placing a heavy metal ball on a rubber sheet) and the rather more bizarre phenomenon known as frame dragging, in which the rotation of the Earth actually drags spacetime around with it. Needless to say, the exacting and incredibly precise observations that GP-B has made possible agree with Einstein's predictions. It looks like there was some interesting technology deployed in the events of the last couple of days - interesting, if not particularly reliable. I got excited for a minute, as my first reaction on seeing the photos was that the US had resurrected the Boeing/Sikorsky Comanche stealth helicopter project that came to an ignominious end a few years ago; it wasn't the most productive way of spending the best part of seven billion dollars, was it? However, the general consensus seems to be that the USMC were using very heavily modified MH-60 Blackhawks. Certainly the bits in the photograph are consistent with modifications to reduce the aircraft's radar signature, which makes a lot of sense if you're carrying out special ops missions. The tail rotor has been made as small as possible and the airframe is as smooth as can be managed; protuberances and turning rotor blades are both extremely good at reflecting radar energy, which is most definitely not what you want to be good at. But the thing is, it's a helicopter. They are inherently noisy, and if one is hovering over your house, believe me - you'll know about it. The idea that a helicopter can be silent like Blue Thunder's "whisper mode" is still pretty much science fiction. So perhaps rather than suffering a "mechanical failure" what happened was that someone on the ground took a shot at it, and got lucky. I doubt we'll ever know for sure. Many thanks to Lauren Beukes for reminding me about the amazing photographs of Pieter Hugo. On Monday the unrelenting good weather finally got to me; I couldn't sit inside any longer. I stuck a macro lens on the camera and headed out in search of mayflies. 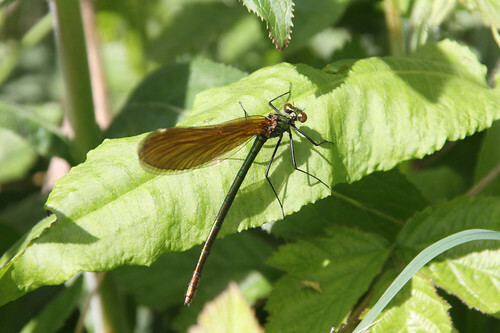 In the past few years I've seen lots of one species (the banded demoiselle) down by the river, and a couple of years ago I got this shot of a female watching out for displaying males which I was rather proud of (I used it on my photo calendar, the following year). So the challenge was simple: could I top that picture? When I got to the place where I'd taken the original shot, I was disappointed. 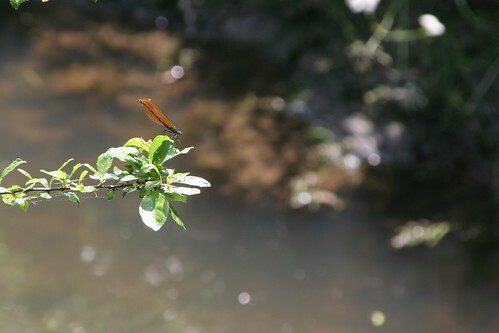 There were lots of small insects flying around, but no mayflies. It was extremely windy, and looking at the situation from a freshly-hatched bug's point of view I knew I'd probably be seeking shelter in the undergrowth rather than risking my new wings flying out in the sunshine. Nevertheless, I waited quietly for while, to see if anything turned up. In the next ten minutes I saw one banded demoiselle shoot across the river and disappear off downwind, and that was it. I decided to walk further down to Huntingford Mill and back along the river, where the trees are bigger and things are a little more sheltered. 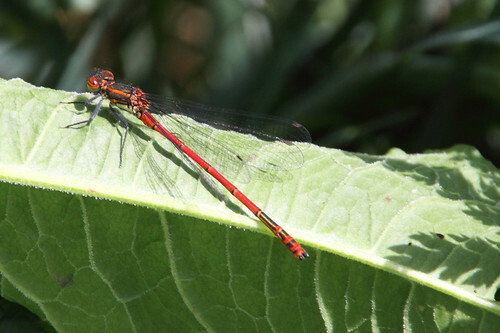 The Large Red Damselfly, Pyrrhosoma nymphula is described in one book I have as "often the first damselfly seen in spring" and "common and widespread" but I can't remember seeing one around here before. I switched to manual focus and shuffled towards its perch on my knees to get this shot, and I was delighted to get such a great picture. But the surprises kept on coming: a few metres further on, a streak of electric blue buzzed over my head. 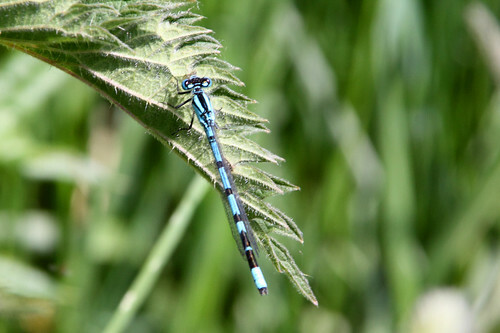 It was Common Blue Damselfly, Enallagma cyathigerum. And this was a first for me - I don't think I've ever seen one before. Three species of damselfly in about a hundred metres was something pretty special, and I had a big smile on my face all the way home! And here we are in May - happy Beltane, everyone. Blimey, wherever this year's going it's getting there at a right old lick. I've been chilling out at home, avoiding wedding coverage and doing a fair bit of writing - I added to my film reviews page this morning with a review of Battle: LA which I enjoyed producing more than I enjoyed watching the film, to be honest. I'm trying to write something - however small or trivial - every day, and I think I'm beginning to get a little better at it. The trouble with long weekends is that I tend to lose track of time, though. I picked up my mobile phone this morning to discover it was as flat as a pancake - I hadn't charged it since Tuesday. If you rang or texted since then, sorry I missed you! I was delighted to see voiceover legend Kerry Shale appear on Dr Who yesterday as Doctor Renfrew - his name should be familiar to anyone who listens to Radio 4 and his readings of Bill Bryson's travel books are about as good as audiobooks get. I still can't make my mind up about this new series, though. It's much much darker than the previous ones, and the incongruities and unexplained occurrences are piling on with a vengeance. Who was the eyepatch lady? How did the hatch in the door disappear? What else has Amy forgotten? What's the deal with what someone on the web was referring to as "Schroedinger's zygote" - is Amy pregnant, or isn't she? What did the Silence mean when they told her "Your part will soon be over"? Is Amy going to be bumped off? And what are we supposed to make of what took place in that last scene in the New York alley? "You've got a screwdriver, go and build a cabinet!" But the flippancy - while more in keeping with previous episodes - felt out of place against the dark tone of the story. The Doctor was coming perilously close to enjoying watching River slaughtering the aliens - and given that Amy would have forgotten about the woman in the toilet being blown up, his reaction against them seemed hugely excessive. Either the approach was woefully misjudged, or there's a lot more going on that has yet to be revealed. Has the Doctor made a terrible mistake? I've never liked carriage clocks. After reading about the German Time Bomb you probably won't either. When a maintenance document includes the line "Do not start dismantling by unscrewing these screws on the back. If you do, the clock may explode" you know you're dealing with something that demands a healthy degree of respect. Preferably from a considerable distance.